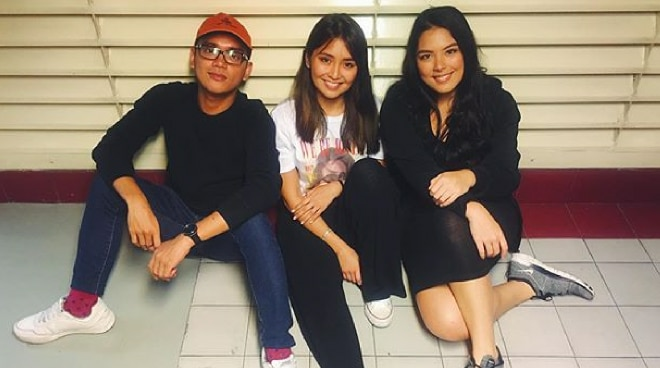 Kathryn Bernardo, Ria Atayde and Juan Miguel Severo found good friendship in each other that even after they finished their roles in the box-office movie The Hows of Us, they still remained friends. I'm keeping these 2018 highlights. In fact, the three recently decided to have a matching piercings to mark their friendship. On Juan Miguel's Twitter post, The three were giggling while showing their newly done helix piercing - according to a report from Cosmopolitan. "Yehey, our friendship piercing," said Kathryn. "Magtatayo na kami ng sorority, sali kayo," Ria joked. On the same day, Juan Miguel also gave two of his books, 'The Missing Piece,' and 'The Missing Piece Meets the Big O' to Ria and Kathryn. On an Instagram post, he wrote, "I was a naive 17-year-old when my SocSci 1 prof (Hello, Miss Chey Billedo!) read these books to our class on the last day of the semester. Together these books changed how I viewed relationships, my sense of self, and the search for fulfillment. And because I love you two, it's time I passed these onto you. I hope they touch you as they did me. Roll away, ladies." I was a naive 17-year-old when my SocSci 1 prof (Hello, Miss Chey Billedo!) read these books to our class on the last day of the semester. Together these books changed how I viewed relationships, my sense of self, and the search for fulfillment. And because I love you two, it's time I passed these onto you. I hope they touch you as they did me. Roll away, ladies. Kathryn, Ria and Juan Miguel played friends in The Hows Of Us movie last year as George, Awee and Mikko respectively.